Austrian family of some importance, which can be traced back to the first half of the eighteenth century. Physician, poet, and writer; born at Prague Nov. 24, 1799; died at Graz June 17, 1878; son of Judah Jeiteles. Having graduated from the gymnasium of his native city at the age of fifteen, he studied medicine at the universities of Prague and Vienna (M.D. 1825). Three years later he was converted to Catholicism. From 1829 to 1835 he was successively prosector and professor in the anatomical department of Vienna University, and from 1835 to 1869 he held the chair of surgical therapeutics at the University of Olmütz. He contributed several scientific dissertations to medical journals and prepared a new edition of A. M. Mayer's "Beschreibung des Ganzen Menschlichen Körpers" (Vienna, 1831). In 1848 he took an active part in the revolutionary movement, edited the journal "Neue Zeit," and represented the Olmütz district in the revolutionary parliament at Frankfort-on-the-Main. Aaron had entered the field of literature while still attending the gymnasium. He wrote a great number of poems, some of which were set to music by Beethoven and other composers. On the centenary of his birth his son published his "Gesammelte Dichtungen," which form the tenth volume of the "Bibliothek der Deutschen Schriftstener aus Böhmen." He pleaded strongly for humanity, justice, and freedom (hence his pseudonym "Justus Frey"), and in his hymn in honor of Huss and Jerome of Prague he attacked the obscurantism of the Roman Church. His former coreligionists found in him a warm defender. In the poem "Warnung" he appealed to them to adhere to their ancestral faith, and gave expression to the pangs which torment the soul of him who without conviction deserts the religion of his fathers. Wurzbach, Biographisches Lexikon, x. 119 et seq. 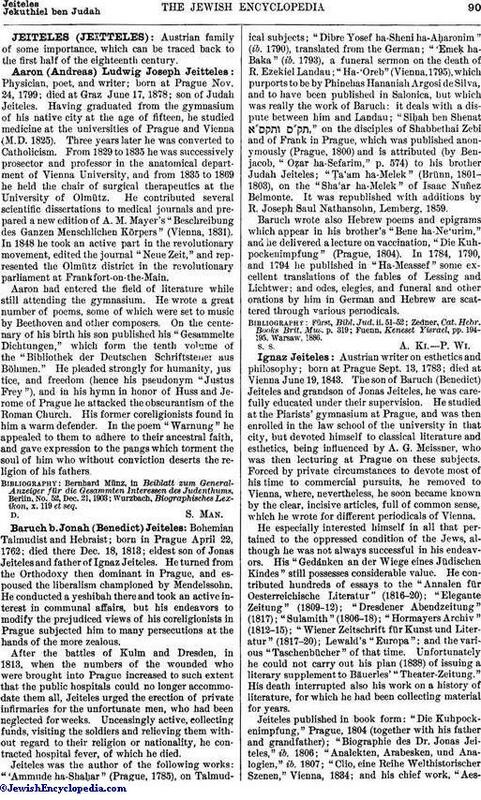 Bohemian Talmudist and Hebraist; born in Prague April 22, 1762; died there Dec. 18, 1813; eldest son of Jonas Jeiteles and father of Ignaz Jeiteles. He turned from the Orthodoxy then dominant in Prague, and espoused the liberalism championed by Mendelssohn. He conducted a yeshibah there and took an active interest in communal affairs, but his endeavors to modify the prejudiced views of his coreligionists in Prague subjected him to many persecutions at the hands of the more zealous. After the battles of Kulm and Dresden, in 1813, when the numbers of the wounded who were brought into Prague increased to such extent that the public hospitals could no longer accommodate them all, Jeiteles urged the erection of private infirmaries for the unfortunate men, who had been neglected for weeks. Unceasingly active, collecting funds, visiting the soldiers and relieving them without regard to their religion or nationality, he contracted hospital fever, of which he died. 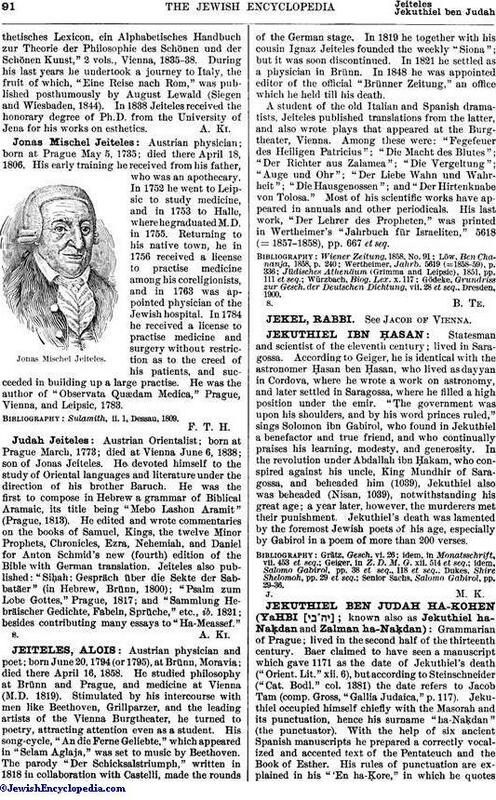 Jeiteles was the author of the following works: "'Ammude ha-Shaḥar" (Prague, 1785), on Talmudical subjects; "Dibre Yosef ha-Sheni ha-Aḥaronim" (ib. 1790), translated from the German; "'Emeḳ ha-Baka" (ib. 1793), a funeral sermon on the death of R. Ezekiel Landau; "Ha-'Oreb" (Vienna, 1795), which purports to be by Phinehas Hananiah Argosi de Silva, and to have been published in Salonica, but which was really the work of Baruch: it deals with a dispute between him and Landau; "Siḥah ben Shenat ," on the disciples of Shabbethai Ẓebi and of Frank in Prague, which was published anonymously (Prague, 1800) and is attributed (by Benjacob, "Oẓar ha-Sefarim," p. 574) to his brother Judah Jeiteles; "Ṭa'am ha-Melek" (Brünn, 1801-1803), on the "Sha'ar ha-Melek" of Isaac Nuñez Belmonte. It was republished with additions by R. Joseph Saul Nathansohn, Lemberg, 1859. Baruch wrote also Hebrew poems and epigrams which appear in his brother's "Bene ha-Ne'urim," and he delivered a lecture on vaccination, "Die Kuhpockenimpfung" (Prague, 1804). In 1784, 1790, and 1794 he published in "Ha-Meassef" some excellent translations of the fables of Lessing and Lichtwer; and odes, elegies, and funeral and other orations by him in German and Hebrew are scattered through various periodicals. Fuenn, Keneset Yisrael, pp. 194-195, Warsaw, 1886. Austrian writer on esthetics and philosophy; born at Prague Sept. 13, 1783; died at Vienna June 19, 1843. The son of Baruch (Benedict) Jeiteles and grandson of Jonas Jeiteles, he was carefully educated under their supervision. He studied at the Piarists' gymnasium at Prague, and was then enrolled in the law school of the university in that city, but devoted himself to classical literature and esthetics, being influenced by A. G. Meissner, who was then lecturing at Prague on these subjects. Forced by private circumstances to devote most of his time to commercial pursuits, he removed to Vienna, where, nevertheless, he soon became known by the clear, incisive articles, full of common sense, which he wrote for different periodicals of Vienna. He especially interested himself in all that pertained to the oppressed condition of the Jews, although he was not always successful in his endeavors. His "Gedanken an der Wiege eines Jüdischen Kindes" still possesses considerable value. He contributed hundreds of essays to the "Annalen für Oesterreichische Literatur" (1816-20); "Elegante Zeitung" (1809-12); "Dresdener Abendzeitung" (1817); "Sulamith" (1806-18); "Hormayers Archiv" (1812-15); "Wiener Zeitschrift für Kunst und Literatur (1817-20); Lewald's "Europa"; and the various "Taschenbücher" of that time. Unfortunately he could not carry out his plan (1838) of issuing a literary supplement to Bäuerles' "Theater-Zeitung." His death interrupted also his work on a history of literature, for which he had been collecting material for years. Jeiteles published in book form: "Die Kuhpockenimpfung," Prague, 1804 (together with his father and grandfather); "Biographie des Dr. Jonas Jeiteles," ib. 1806; "Analekten, Arabesken, und Analogien," ib. 1807; "Clio, eine Reihe Welthistorischer Szenen," Vienna, 1834; and his chief work, "AesthetischesLexicon, ein Alphabetisches Handbuch zur Theorie der Philosophie des Schönen und der Schönen Kunst," 2 vols., Vienna, 1835-38. During his last years he undertook a journey to Italy, the fruit of which, "Eine Reise nach Rom," was published posthumously by August Lewald (Siegen and Wiesbaden, 1844). In 1838 Jeiteles received the honorary degree of Ph.D. from the University of Jena for his works on esthetics. Austrian physician; born at Prague May 5, 1735; died there April 18, 1806. His early training he received from his father, who was an apothecary. In 1752 he went to Leipsic to study medicine, and in 1753 to Halle, where he graduated M. D. in 1755. Returning to his native town, he in 1756 received a license to practise medicine among his coreligionists, and in 1763 was appointed physician of the Jewish hospital. In 1784 he received a license to practise medicine and surgery without restriction as to the creed of his patients, and succeeded in building up a large practise. He was the author of "Observata Quædam Medica," Prague, Vienna, and Leipsic, 1783. Sulamith, ii. 1, Dessau, 1809. Austrian Orientalist; born at Prague March, 1773; died at Vienna June 6, 1838; son of Jonas Jeiteles. He devoted himself to the study of Oriental languages and literature under the direction of his brother Baruch. He was the first to compose in Hebrew a grammar of Biblical Aramaic, its title being "Mebo Lashon Aramit" (Prague, 1813). He edited and wrote commentaries on the books of Samuel, Kings, the twelve Minor Prophets, Chronicles, Ezra, Nehemiah, and Daniel for Anton Schmid's new (fourth) edition of the Bible with German translation. Jeiteles also published: "Siḥah: Gespräch über die Sekte der Sabbatäer" (in Hebrew, Brünn, 1800); "Psalm zum Lobe Gottes," Prague, 1817; and "Sammlung Hebräischer Gedichte, Fabeln, Sprüche," etc., ib. 1821; besides contributing many essays to "Ha-Meassef."